Britain's Got Talent, the hit ITV talent show, has continued to attract large audience shares, pulling in an average of 44 per cent of viewers on Saturday night. The show aired between 8pm and 9.20pm, and drew 9.4 million viewers. At its peak Britain’s Got Talent had 11.2 million viewers, or a 52 per cent share. The launch show on 11 April took in an audience of 10.1 million, a 46 per cent share. 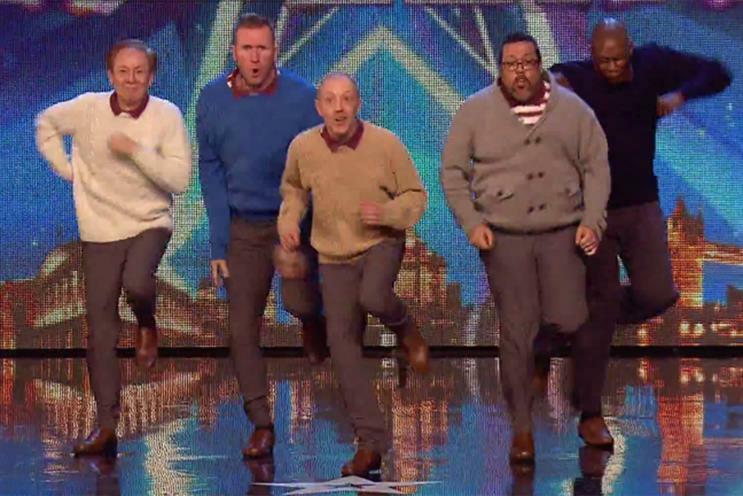 Saturday’s episode featured dance act Old Men Grooving, the same performers in the Sainsbury’s Christmas jumper viral. They took the audience and judges by surprise when they danced to a mixture of hip hop tracks. The Britain’s Got Talent performance received plenty of praise on Twitter, with many fans saying the dance group should win the competition. The group’s Facebook video for Sainsbury’s, created by Gravity Road, generated one million views in two days. It featured the men wearing Christmas jumpers and performing a choreographed dance routine to Dance of the Sugar Plum Fairy by Tchaikovsky.